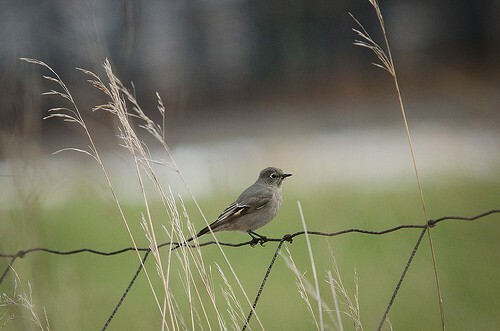 – Comments: “Very obliging bird hanging out on grasses at edge of road, on fence and in roadside shrubs. Once I got out of my car it flew towards me giving great looks. Fairly dark overall, around Kingbird size maybe…but with longer tail. White either side of the tail. Light wing flashes at base of flight feathers. Distinct white eye ring narrowing around front of eye. Will admit to moving location to inside the county after the fact as it would appear the county line is the road. Bird was actually photographed on both sides of road.